For the community in Humboldt County, see Riverside, Humboldt County, California. Clockwise: Mission Inn; First Congregational Church; Riverside Art Museum; Riverside County Courthouse; First Church of Christ. The first orange trees were planted in 1871, with the citrus industry Riverside is famous for beginning three years later (1874) when Eliza Tibbets received three  Brazilian navel orange trees sent to her by a personal friend, William Saunders who was a horticulturist at the United States Department of Agriculture in Washington, D.C. The trees came from Bahia, Brazil. The Bahia orange did not thrive in Florida, but its success in southern California was phenomenal. The first navel orange tree in California replanted here by President Theodore Roosevelt, ca. 1910. The three trees were planted on the Tibbetts' property. One of them died after it was trampled by a cow during the first year it was planted. After the trampling, the two remaining trees were transplanted to property belonging to Sam McCoy to receive better care than L. C. Tibbetts, Eliza's husband, could provide. 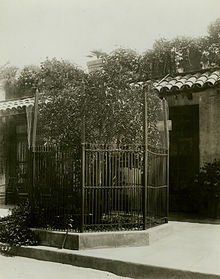 Later, the trees were again transplanted, one at the Mission Inn property in 1903 by President Theodore Roosevelt (this tree died in 1922), and the other was placed at the intersection of Magnolia and Arlington Ave. Eliza Tibbets was honored with a stone marker placed with the tree. That tree still stands to this day inside a protective fence abutting what is now a major intersection. As the city grew, a small guest hotel designed in the popular Mission Revival style, known as the Glenwood Tavern, eventually grew to become the Mission Inn, which was favored by presidents, royalty and movie stars. Inside was housed a special chair made for the sizable President William Howard Taft. 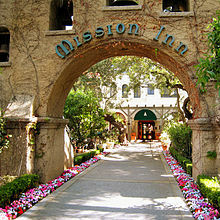 The hotel was modeled after the missions left along the California coast by Franciscan friars in the 18th and 19th centuries. (Although Spanish missionaries came as far inland as San Bernardino (San Bernardino de Sena Estancia), east of Riverside, there was no actual Spanish mission in what is now Riverside.) Postcards of lush orange groves, swimming pools and magnificent homes have attracted vacationers and entrepreneurs throughout the years. Many relocated to the warm, dry climate for reasons of health and to escape Eastern winters. Victoria Avenue, with its scattering of elegant turn-of-the-century homes, and citrus-lined paseo, serves as a reminder of European investors who settled here. Riverside is the 59th largest city in the United States, the 12th largest city in California, and the largest city in California's Inland Empire metro area. 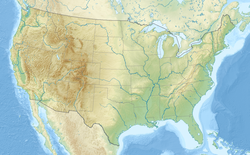 According to the United States Census Bureau, the city has a total area of 81.4 square miles (210.8 km2), of which 81.1 square miles (210 km2) is land and 0.3 square miles (0.78 km2) (0.37%) is water. The elevation of downtown Riverside is 860 feet (260 m). Hills within the city limits include Mount Rubidoux, a city landmark and tourist attraction. Riverside is surrounded by small and large mountains, some of which get a dusting of winter snow. Many residents also enjoy the many beaches of Southern California. Riverside is about a 47-mile drive to the Pacific Ocean and is close to Orange County and Los Angeles County. A panorama of Riverside, California, taken from the summit of Mount Rubidoux, 1908. Riverside is the home of the "World's Largest Paper Cup" (actually made of concrete), which is over three stories (68.10 ft; 20.76 m) tall. The "Dixie Cup" landmark is located on Iowa Street just north of Palmyrita, in front of what was once the Dixie Corporation's manufacturing plant (now closed down). Three notable hills are in Riverside's scenic landscape: Box Springs Mountain, Evans (Jurupa) Hill and Tecolote Hill; all of which are preserved open spaces. South of Riverside is Lake Mathews. There is also the well-known landmark/foothill, Mount Rubidoux, which is next to the Santa Ana River and one of the most noticeable landmarks in the downtown area. This foothill is the dividing line between the town of Rubidoux and the city of Riverside. March Joint Air Reserve Base borders Riverside on the east serving as a divider between the city and Moreno Valley. March ARB, founded in 1918, is the oldest operating Air Force base west of the Mississippi River. At the entrance to Riverside from the 60 freeway sits Fairmount Park. This extensive urban oasis was designed by the firm founded by Frederick Law Olmsted, which had designed New York's Central Park. A lovely stocked pond that is home to many species of birds. On nearby private land is the former site of Spring Rancheria, a Cahuilla village. To the east of downtown is the originally named "Eastside," which grew out of a colonia inhabited by Mexican immigrant workers in the orange groves, other orchards and produce fields. The area these people lived in was originally a settlement called La Placita that predated the city being founded in 1843. Mexican communities were also formed in the barrio of Casa Blanca during the early twentieth century. The City Council has proposed many annexations of nearby unincorporated communities which will increase its population and land area over the next few years. Most notable is the Lake Hills/Victoria Grove area, which would extend its southwestern borders to Lake Mathews. City limit map which shows possible annexations. Riverside is home to the University of California, Riverside. The UCR Botanical Gardens contains 40 acres (16 ha) of unusual plants, with four miles (6 km) of walking trails. The city prides itself on its historic connection to the navel orange, which was introduced to North America from Brazil by the first settlers to Riverside in 1873. 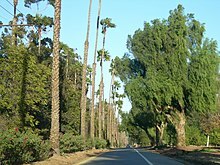 Riverside is home to the one surviving Parent Navel Orange Tree, from which all American West Coast navel orange trees are descended. Kaiser Foundation Hospital – Riverside is a General Acute Care Hospital with Basic Emergency Services as of 2006. Riverside is also home to the Riverside Public Library system. Branches include: Arlanza, Arlington, La Sierra, Marcy, Main, Orange Terrace, Eastside Cybrary, and Casa Blanca. Convention facilities are available at several locations. The Riverside Convention Center, remodeled in 2014, offers 66,000 sq ft (6,100 m2) indoors and 14,000 sq ft (1,300 m2) outdoor space. Also available is the Riverside Marriott with 14,000 sq ft (1,300 m2) indoors, and the Mission Inn with 15,000 sq ft (1,400 m2) indoors and 5,000 sq ft (460 m2) outdoors. All three facilities are located within walking distance of each other in downtown Riverside. 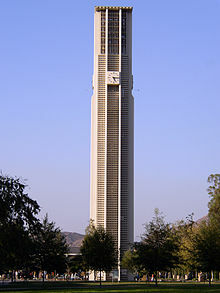 Meetings with an academic focus are also held at the University of California, Riverside. Crestlawn Memorial Park – notable burials include Medal of Honor recipient George Alan Ingalls, baseball player Mike Darr, and actor Roland Harrah III. Evergreen Cemetery – notable burials include Marcella Craft, Frank Augustus Miller, John W. North, Eliza Tibbets, and Al Wilson. Olivewood Cemetery – notable burials include Medal of Honor recipients Jesus S. Duran and Ysmael R. Villegas (re-buried at Riverside National Cemetery in 1976), Travis Alexander, Dorothy Burgess, Mayor Ben H. Lewis, Del Lord, Gloria Ramirez, and Eric Show. Riverside National Cemetery, established in 1976, is the third-largest cemetery managed by the National Cemetery Administration, and since 2000 has been the most active in the system based on the number of interments. Riverside experiences a Mediterranean Csa influenced semi-arid (Köppen climate classification BSh) climate with hot, dry summers and mild, relatively wet winters. Normal monthly mean temperatures range from 54.5 °F (12.5 °C) in December to 79.4 °F (26.3 °C) in August. On average, temperatures reach the freezing mark and 100 °F (38 °C) on 2.5 and 14.6 days annually, respectively. Record temperatures range from 18 °F (−8 °C) on January 15, 1911, up to 118 °F (48 °C) on July 17, 1925, June 16, 1917, and July 6, 2018. On average, Riverside receives 10.33 in (262 mm) of precipitation annually, with measurable precipitation occurring on 30 days, with most of it occurring in the winter and early spring, especially January through March, with February the wettest month. The Riverside area is referred to as a "smog belt" because of its above-average level of air pollution. In a comparison by the National Campaign Against Dirty Air Power (2003), the Riverside-San Bernardino-Ontario area was found to be one of the most polluted regions based on year-round particle measurements when compared to other U.S. cities. [NEJM 2004;351:1057-1067] Due to the smog problems, the city has made efforts to reduce pollution by incorporating additional means of mass transit (Metrolink) and equipping its entire fleet of buses with natural gas. Smog decreased considerably over the next few years as local municipalities and counties worked with the South Coast Air Quality Management District to implement measures to improve regional air quality. The smog alerts that people remember from decades ago are history. Most of Riverside's smog problems are the result of the prevailing wind patterns that blow the smog from the Los Angeles Basin and particulates generated by southern California's multitude of vehicles, and the Port of Los Angeles and Port of Long Beach into the Inland Empire. As of the 2010 census reported that Riverside had a population of 303,871. The population density was 3,731.0 people per square mile (1,440.6/km²). The racial makeup of Riverside was 171,669 (56.5%) White, 21,421 (7.0%) African American, 3,467 (1.1%) Native American, 22,566 (7.4%) Asian (1.7% Filipino, 1.6% Chinese, 1.1% Korean, 1.0% Vietnamese, 0.8% Indian, 0.3% Japanese, 0.1% Pakistani), 1,219 (0.4%) Pacific Islander, 68,111 (22.4%) from other races, and 15,418 (5.1%) from two or more races. Hispanic or Latino of any race were 148,953 persons (49.0%); 41.8% of Riverside's population is Mexican, 1.1% Guatemalan, 1.0% Salvadoran, 0.7% Puerto Rican, 0.3% Cuban, 0.2% Nicaraguan, and 0.2% Colombian. Non-Hispanic Whites were 34.0% of the population in 2010, down from 82.1% in 1970. The population was spread out with 81,406 people (26.8%) under the age of 18, 47,126 people (15.5%) aged 18 to 24, 82,482 people (27.1%) aged 25 to 44, 66,615 people (21.9%) aged 45 to 64, and 26,242 people (8.6%) who were 65 years of age or older. The median age was 30.0 years. For every 100 females, there were 97.6 males. For every 100 females age 18 and over, there were 95.4 males. In the city, the population was spread out with 30.1% under the age of 18, 12.9% from 18 to 24, 30.0% from 25 to 44, 18.0% from 45 to 64, and 9.0% who were 65 years of age or older. The median age was 30 years. For every 100 females, there were 97.1 males. For every 100 females age 18 and over, there were 93.6 males. Riverside is largely Christian and is home to Catholic, Eastern Orthodox, Mormon, Protestant, and Universalist Unitarian churches, an Islamic mosque, Jewish synagogue, Hindu temple, and several Buddhist temples. Riverside is also home to the Inland Empire Atheists and Agnostics organization. Large Seventh-Day Adventist populations, due to La Sierra University is located in Riverside and proximity to Loma Linda near San Bernardino. Also a large Mormon population, also found in San Bernardino area, as the Church of Jesus Christ of Latter-Day Saints has missions in Riverside and Redlands near their temple. Several religious celebrations take place on top of the city's Mount Rubidoux. One is an annual Easter Sunrise service, which is the nation's oldest continual non-denominational outdoor Easter service The 100th anniversary of the event was held April 12, 2009. Each December, a 2½-mile (4 km) procession from Our Lady of Guadalupe Shrine to the top of Mount Rubidoux promotes awareness of Juan Diego's walk up Tepeyac hill, in 1531, where he reportedly saw a Marian apparition known as Our Lady of Guadalupe. In 2012, a controversy erupted regarding the cross atop Mount Rubidoux, which was on city-owned land and maintained by the city. Due to constitutional issues regarding separation of church and state, the Riverside City Council sold the cross and the land under it (0.43 acres; 1740.15 sq m) to a private entity for $10,500. Citrus is in decline in many areas of the Inland Empire where urbanization and water scarcity have made the industry uneconomic. Riverside's economy consists largely of light-industry and generates a range of products including aircraft components, automotive parts, gas cylinders, electronic equipment, food products, and medical devices. Supporting the manufacturing sector are several industrial parks, including those in the Hunter Industrial Park, Sycamore Canyon Industrial Park and Airport Industrial Areas. As the county seat of Riverside County and the most populous city in the Inland Empire, Riverside also houses several legal, accounting, engineering, and banking firms. Citrus production and packing houses still exist within the city, but the industry is in decline. 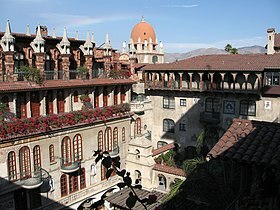 Riverside's close proximity to Hollywood, combined with its many unique architectural features, has made it a frequent filming choice by film studios, starting with the 1919 film Boots, which starred Dorothy Gish and was filmed at the Mission Inn. Episodes of the 2013 television celebrity diving program Splash are taped at Riverside Community College's aquatics complex, and a local gay bar named V.I.P. was the setting for the second episode of Season Five of the Bravo TV Reality show Tabatha Takes Over. The HBO show Enlightened (2011–2013), which starred Laura Dern, was also set in Riverside. Retail shopping centers include the open-air Riverside Plaza, and the Galleria at Tyler mall. The Main Street Pedestrian Mall in downtown is the site of several unique shops. Each year in February The Riverside Dickens Festival is held to "enhance a sense of community among citizens of Riverside County and Southern California by creating a series of literary events and to provide educational, family-oriented, literary entertainment and activities such as plays, musical performances, pageants, living history presentations, workshops, lectures, classroom study, exhibits and a street bazaar with free entertainment, vendors and costumed characters." In October, the California Riverside Ballet sponsors the Ghost Walk, which in 2013 celebrated its 22nd year. The event is an adventure through some of the city's oldest and most historic buildings, with volunteers leading tours and telling tales of ghouls and ghosts. The Riverside Festival of Lights centers around the Mission Inn Hotel & Spa, located downtown. Decoration of the Inn begins in October and a lighting ceremony that includes speakers, fireworks, and live musicians takes place the day after Thanksgiving Day. The Inn puts up more than three million lights and hundreds of animated characters. Carolers, horse-drawn carriage rides, and ice skating all color the festival. Restaurants, cafes, and community groups all contribute to the festival. The festival runs through New Year's Day. Also during the week of Thanksgiving, the Festival of Trees is held at the Riverside Convention Center. Held since 1990, the event seeks to raise money for the Riverside County Regional Medical Center children's units including the Neonatal Intensive Care Unit, the Child Abuse and Neglect Unit, and the Pediatric Intensive Care Unit. Attracting 25,000 people per year, the event has raised over $5 million since its inception. At the Festival of Trees, many professionally decorated Christmas trees are judged, auctioned, and then displayed for public viewing. Other activities include entertainment, a children's craft area, a sweet shop, and Storytime with Santa. Riverside is governed by a mayor and city council. The mayor is elected in a citywide election. The city council has seven members, each elected from single member wards. A city manager is responsible for ongoing city services. In Riverside's Comprehensive Annual Financial Report for the fiscal year ended June 30, 2013, the city's government accounts were reported to have $244 million in revenues and $365 million in expenditures, with the deficiency made up by the issuance of long-term debt and transfers from the city-owned utilities (including electric and water). The report also indicates that over the past 9 years, the number of city employees increased by 23.6% to 2686 FTE, outpacing the 12.5% increase in the number of residents. Under the electoral maps drawn by the Citizens' Redistricting Commission, which were first used in the 2012 elections and will remain in effect through at least 2020, Riverside's state and federal legislative districts have changed substantially. In the California State Legislature, the City of Riverside is in the 31st Senate District, represented by Democrat Richard Roth. In the California State Assembly, it is split between the 60th Assembly District, represented by Democrat Sabrina Cervantes, and the 61st Assembly District, represented by Democrat Jose Medina. In the United States House of Representatives, nearly all of Riverside is in California's 41st congressional district, represented by Democrat Mark Takano, while a tiny portion of the city is part of California's 42nd congressional district, represented by Republican Ken Calvert. In the United States Senate, California is represented by Democrats Dianne Feinstein and Kamala Harris. Riverside's crime rate has shown a drop over the past several years. According to the FBI's Uniform Crime Reporting Statistics database, from 2002 to 2014 violent crime fell to 1,384 from 2,026 events, and property crime to 9,864 from 13,135 events. During this time, the population of the city rose by 21%. To help reduce gang-related crime, the city developed Project Bridge, an anti-gang program under the city of Riverside's Park and Recreation Department. Gang activity has been reported to center in the Casa Blanca, Arlanza and Eastside neighborhoods. Of the 60 largest US police departments in 2015, the Riverside Police Department was the only department whose police did not kill anyone that year. California School for the Deaf, Riverside (CSD-R) for the Deaf and Hard of Hearing from Preschool to 12th grade has been open since 1952. The CSD-R varsity football team, the Riverside Cubs, had an undefeated season which led to an appearance on a May 2006 segment on ABC's 20/20 news series. Riverside won a $3 million grant from the Bill and Melinda Gates Foundation in 2010. As a result, the Completion Counts initiative was created as a joint partnership by the city of Riverside, Riverside City College, Alvord Unified School District, Riverside Unified School District, Riverside County Office of Education, UC Riverside, and the Greater Riverside Chambers of Commerce to double college graduation rates by 2020. Only Riverside, New York City, San Francisco, and Mesa, Arizona received such a grant. The partnership is creating measures that help students across Riverside earn a degree. For example, RCC will now give 2012 graduates of AUSD and RUSD priority class registration, and a two-year guarantee to complete an associate degree or transfer to a four-year university. Completion Counts is also ensuring that AUSD, RUSD and RCC work together to create a seamless math and English curriculum to prepare students for college-level work. High school and college student counselors are meeting regularly to agree on the best ways to get students ready for college. Riverside is served by three major freeways, the I-215, the State Route 60, and the State Route 91. These three freeways meet in north-eastern Riverside at the rebuilt 60/91/215 interchange that was completed in late 2007. 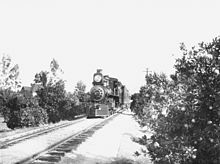 Southern Pacific Railroad train running through the tracks in an orange grove in Riverside, California, ca. 1910. The city contains two Metrolink commuter rail stations, Riverside-Downtown and Riverside-La Sierra. Both are served by the Inland Empire-Orange County and 91 Lines, and the Downtown station is served by the Riverside Line on weekdays, and the San Bernardino Line on weekends. Amtrak's Southwest Chief which runs from Los Angeles to Chicago also serves the city. Local bus service is provided by the Riverside Transit Agency. The agency had proposed a new bus rapid transit route to travel along the current Route 1 from the University of California, Riverside to Corona. The project may come to fruition as more funding is made available. Intercity bus service is provided by Greyhound Lines, Amtrak California, and a handful of small operators serving the cross-border market into Mexico. The nearest airport for commercial airline service is Ontario International Airport in Ontario, California. The Riverside Municipal Airport is an airport within Riverside's city limits, but does not have commercial airline service. It is primarily used for private aviation, and is also the location for the annual Riverside Air Show. Riverside, California's sister city sign in front of White Park in downtown Riverside. The Sendai Committee is working on setting up a secure e-pal system whereby the residents of Sendai and Riverside can exchange emails in a fashion similar to pen pals. The aim is to promote grassroots cultural exchange between the two sister cities. The city of Riverside established an economic partnership program with the state of Oaxaca, Mexico in the early 2000s (decade). Brown Jr, John and James Boyd. History of San Bernardino and Riverside Counties; With Selected Biography of Actors and Witnesses of the Period of Growth and Achievement, 3 volumes, The Western Historical Association, 1922. The Lewis Publishing Company, Chicago, Illinois. Gunther, Jane Davies. Riverside County, California, Place Names; Their Origins and Their Stories, Riverside, CA, 1984. LOC catalog number: 84-72920. Patterson, Tom. A Colony For California; Riverside's First Hundred Years. Second Edition 1996. The Museum Press of the Riverside Museum Associates, Riverside, California. ISBN 0-935661-24-7. Patterson, Tom. Landmarks of Riverside; and the Stories Behind Them. 1964. Press~Enterprise Co., Riverside, California. Library of Congress Catalogue Card No. 64-15204. ^ "Over One Hundred and Twenty-Five Years of Service" (PDF). City of Riverside. Retrieved March 17, 2015. ^ "Riverside City Charter" (PDF). City of Riverside. Retrieved January 28, 2015. ^ "City Manager". Riverside, California. Retrieved November 28, 2018. ^ "City Council". Riverside, California. Retrieved October 7, 2014. ^ "Riverside". Geographic Names Information System. United States Geological Survey. Retrieved October 22, 2014. ^ "Riverside (city) QuickFacts". United States Census Bureau. Retrieved February 28, 2015. ^ a b "Population and Housing Unit Estimates". Retrieved February 22, 2019. ^ "Local History: Finding aids". Riverside Public Library. Retrieved February 19, 2015. ^ Brown and Boyd, Vol 2. 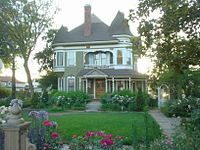 ^ H. Vincent Moses wrote in 1982 that Riverside was the wealthiest U.S. city per capita in 1895. Dr. Moses is a city historian. See "Machines in the Garden: A Citrus Monopoly in Riverside, 1900–31", published in California History, Spring 1982. ^ calculate travel time. "Flight Distance from Riverside, CA to Laguna Beach, CA". Travelmath.com. Retrieved February 8, 2013. ^ "rehabilitation". Archived from the original on May 11, 2008. ^ Franko, Vanessa. Sheryl Crow opens the first night of entertainment at the Fox, The Press-Enterprise, January 22, 2010. Retrieved July 23, 2010. ^ "City of Riverside, California - Park & Recreation". riversideca.gov. ^ "Riverside, California - City of Arts & Innovation - At Home in Riverside". riversideca.gov. ^ "Riverside, California - City of Arts & Innovation - Planning". www.riversideca.gov. ^ Riverside Convention Center and Visitor's Bureau. Retrieved October 30, 2010. ^ Santschi, Darrell R. (February 23, 2014). "Riverside med to get top honor: Jesus S. Duran and Salvador J. Lara will be awarded the Medal of Honor". The Press-Enterprise. ^ a b c "Station Name: CA RIVERSIDE MUNI AP". National Oceanic & Atmospheric Administration. Retrieved April 18, 2018. ^ a b "NOWData - NOAA Online Weather Data". National Oceanic and Atmospheric Administration. Retrieved April 18, 2018. ^ a b "CA Riverside Fire STN 3". National Oceanic and Atmospheric Administration. Retrieved April 18, 2018. ^ "Air pollution and lung development". Retrieved March 17, 2006. ^ "California Air District Website Links". scaqmd.org. ^ "50 Years, How Close Are We to the Goal?". ^ a b "Riverside (city), California". State & County QuickFacts. U.S. Census Bureau. Retrieved April 30, 2012. 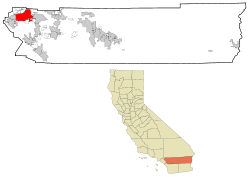 ^ a b c "California – Race and Hispanic Origin for Selected Cities and Other Places: Earliest Census to 1990". U.S. Census Bureau. Archived from the original on August 6, 2012. Retrieved April 30, 2012. ^ "2010 Census Interactive Population Search: CA - Riverside city". U.S. Census Bureau. Retrieved July 12, 2014. ^ "Riverside (city) QuickFacts from the US Census Bureau". census.gov. ^ US. "Inland Empire Atheists, Agnostics & Skeptics Meetup Group (Riverside, CA) – Meetup.com". Inlandempireatheists.com. Retrieved June 1, 2010. ^ "West Briefs – 4/15/09 | Riverside County | PE.com | Southern California News | News for Inland Southern California". PE.com. April 14, 2009. Retrieved June 1, 2010. ^ "Press Enterprise : Riverside County California News, Sports and Entertainment". pe.com. ^ "Mount Rubidoux Cross: Auction winner will keep Riverside landmark". Press Enterprise. 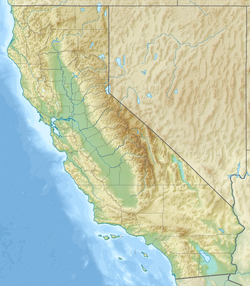 ^ "Background Information and Statistics: California's Citrus Industry". Retrieved January 2, 2012. ^ "City of Riverside, California Comprehensive Annual Financial Report, for the Year ended June 30, 2016". ^ "home - ShopRiversideNow.com". ShopRiversideNow.com. ^ "Sherman Indian Museum". shermanindianmuseum.org. ^ "Welcome to the Frontpage". Dickensfest.com. Retrieved June 1, 2010. ^ "Riverside Airshow - Riverside Airport". riversideca.gov. Archived from the original on September 24, 2006. 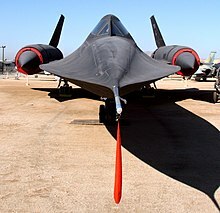 ^ "Riverside Airshow 2011 - Photo Review". thingstodoinlandempire.com. ^ "Riverside International Film Festival". Retrieved May 1, 2010. ^ "Festival of Trees Web Page". ^ "Who To Call in Sacramento & Washington DC". Riverside, California. Retrieved November 23, 2014. ^ a b c "United States Courts". United States Courts. ^ "United States District Court, Central District of California, Riverside". ^ "Site Has Moved". ca.gov. ^ "The Superior Court of California, County of Riverside - Traffic". ca.gov. ^ "Uniform Crime Reporting Statistics". ucrdatatool.gov. Archived from the original on July 3, 2013. ^ "2015 Police Violence Report". Mapping Police Violence. Retrieved December 21, 2015. ^ "California Southern Law School :: Home". cslawschool.com. ^ La Sierra University (July 15, 2015). "About La Sierra University - La Sierra University". lasierra.edu. ^ "Riverside City College". rcc.edu. ^ Medina, Jennifer (June 1, 2012). "California Cuts Threaten the Status of Universities". NY Times. Retrieved November 4, 2014. Students at the University of California, Riverside, taking a midterm exam in a psychology class that has an enrollment of 570. ^ "California Researchers Find New Tool Against the Asian Citrus Psyllid". Entomology Today. October 27, 2014. Now a research team at the University of California, Riverside has found a new tool that targets the ACP's olfactory system, and they've identified a suite of odorants (odor molecules) that the insect detects. Some of these odorants can modify the behavior of ACP and may lead to the development of tools to tackle its spread. ^ California School for the Deaf - Riverside. "California School for the Deaf". ca.gov. ^ "LSA High School". lsak12.com. ^ "Notre Dame High School". Notre Dame High School. ^ "Riverside Christian Schools". rivchristian.org. ^ "Woodcrest Christian High School". ^ "Riverside: RCC trustees hear two-year guarantee plan". Press Enterprise. 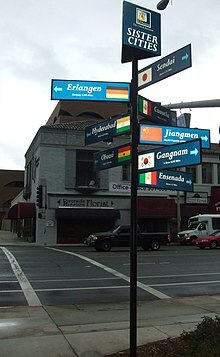 ^ "Riverside's Sister Cities". City of Riverside, California. 2009. Retrieved August 5, 2009. Lech, Steve (2007). Riverside 1870–1940. Charleston, SC: Arcadia Publishing. ISBN 978-0-7385-4716-9. OCLC 127273299.